Welcome back to the 2015-2016 season of the Paris Opéra Ballet! At the end of October, we were treated to a performance of new works by Belgian contemporary dance choreographer Anne-Teresa De Keersmaeker. Featuring music by Béla Bartók, Ludwig van Beethoven and Arnold Schönberg, the coproduction between the Paris Opéra Ballet and Idéal Audience and Arte, who recorded it for television, was a very unique and diverse evening of contemporary dance. The first piece of the evening showcased a four piece string ensemble directly onstage behind the dancers, who were also a quartet. Dressed in simple, yet slightly different black dresses and short ankle boots, the dancers began to shift positions and walk in silence before the music. Silence is such a powerful choice in dance, especially at the beginning of a piece. With nothing else to focus on, the audience is completely drawn into the movement, however big or small, and the experience of that kind of focused energy in a theatre is very exciting. The music then began without warning or introduction and the dancers launched themselves into the movement with similar abandon and spontaneity. Béla Bartók’s composition has a tense, high-strung quality to it that seeped into the dancers’ movement vocabulary. The music doesn’t build – it starts already at an 8 or 9. The musician’s bows flew furiously as the dancers turned and jumped in succession; their unkempt hair got in their faces as they made their way to the floor and got back up again just as quickly. Their boots gave the piece an interesting percussive quality that was very blatantly unballet-like, as was their sometimes audible exhales. The movement was together but never completely in unison as the dancers each took turns being the one either slightly ahead or behind the others at any given moment. This gave the piece a raw, unpolished impression, as well as a sense of angst and frustration, which in my opinion, are unusual feelings to experience during a performance at Palais Garnier. But I think that was the intention of the piece – it wasn’t what I expected and because of that, it was very interesting choreography to watch. The unexpected kept coming with the next piece, Die Grosse Fuge by Beethoven. More musicians joined the large ensemble of men and one woman, dressed in black suits and dress shoes, onstage. This piece of music was lighter, yet still had an underlying current of melancholy to it, similar to the first piece. The choreography was very light and flowing – it had a Jerome Robbins flavour to it, with lots of big gallops and tucked jumps; I was at times reminded of the opening scene of West Side Story. The energy was buoyant, yet ‘business-like’, which I saw reflected in the costume design. However, as the dynamics of the music shifted during the 20 minute piece, the number of dancers onstage during the variations changed, and the suit jackets came off to reveal flowing white dress shirts or plain white tees. I liked the flow of this piece and how the dancers moved so seamlessly from jumping to rolling on the floor. The dancers’ strength was evident in their jumps but nothing felt forced or bigger than it needed to be and their arms had that relaxed, ‘jazzy’ quality to them with no set positions, just used effortlessly. It was a very intriguing piece. The final piece, which translates to Transfigured Night, was the most visually unique and stunning of the evening. Huge tree trunks hung from the ceiling around the back and sides of the stage, which was covered by red leaves or rose petals. The piece was lit entiredly from the sides, which cast dark and mysterious shadows across the stage and the dancers’ themselves as they moved through the light and darkness of the ‘forest’. The women each wore different styles of dresses, in different fabrics and colours and the men wore a version of a suit/shirt and slacks. The costume design was distinctly ‘uncostume-y’ and gave each dancer a sense of visual individuality, which complimented their individual interpretations of the choreography. There was a hint of a narrative quality to Verklärte Nacht, but with no set characters or conflict. Thematically, it felt to me to be about a tumultuous love experience. The dancers were brilliant in their solo, partner or group variations and it was wonderful to see the entire ensemble together for what was a beautiful, striking and emotional final piece from this innovative choreographer. The audience seemed to love it by the number of curtain calls it demanded of the performers and it was a special thrill to see the dancers welcome Anne-Teresa De Keersmaeker herself to the stage to have her moment. In an art form that holds so much respect and reverence for the pioneers of the past, it felt very special to celebrate new work and to know that bold and exciting choreographers are right here in the present, creating new repertoire to inspire and challenge dancers and audiences alike. 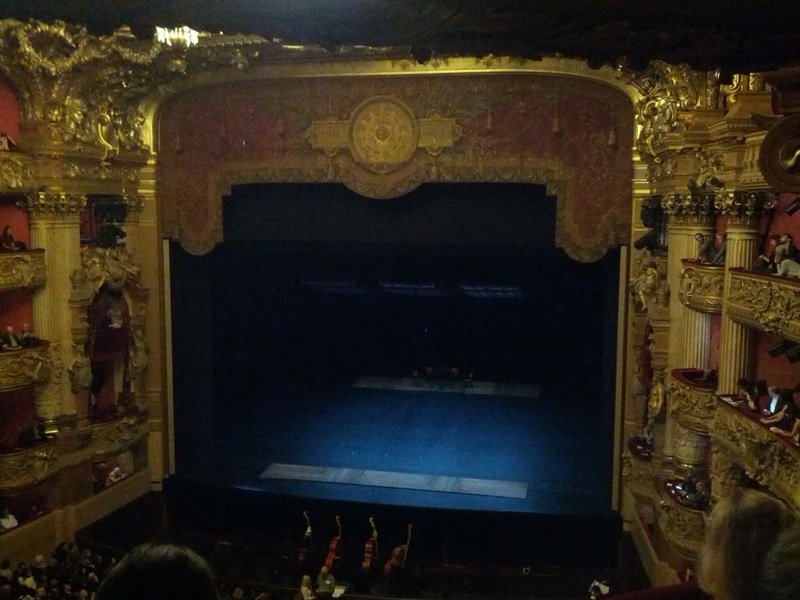 The 2015-2016 Paris Opéra Ballet season is off to great start and I can’t wait to see what’s next. I hope you'll join me again on this year's exciting journey. 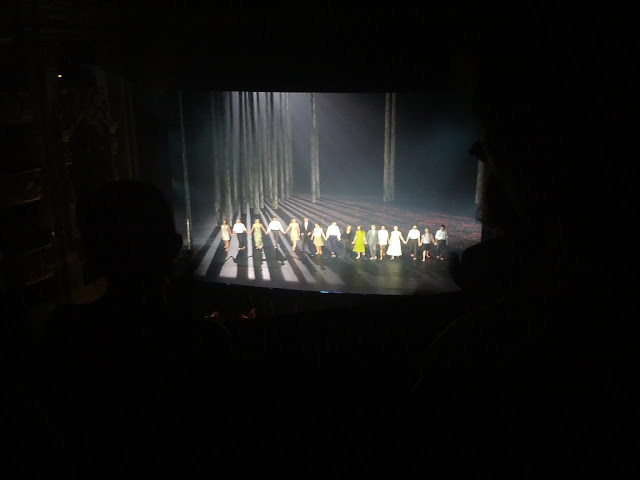 Paris Opera Ballet ensemble and choreographer Anne-Teresa De Keersmaeker take their bows together.